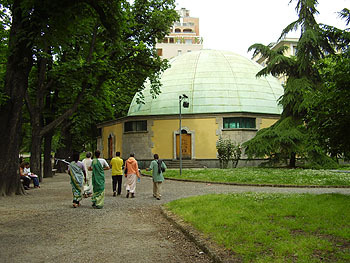 Sripad Goswami Maharaj and the other devotees made their way towards the planetarium dome. 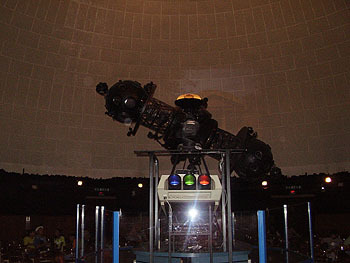 The machine that realised the night sky on the dome's interior had turned 76 years old the previous day of our visit! Once inside we spent about an hour listening to Greek mythology stories explaining how the constellations came to be in the night sky. 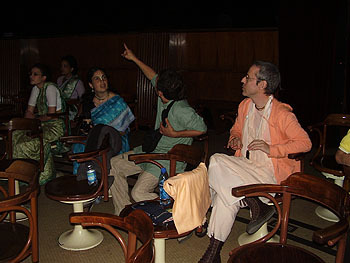 The devotees who understood Italian translated for those who didn’t, but more intriguing than the stories was the effect of seeing the night sky as it would appear without light pollution from the city. The devotees were fascinated by what they saw. 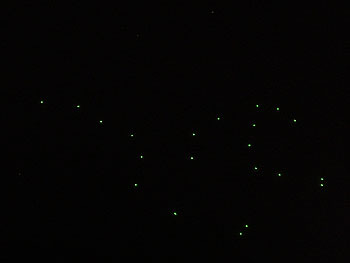 Some recent special effects made it possible to see the constellations and their position very clearly. This is the Big Bear. 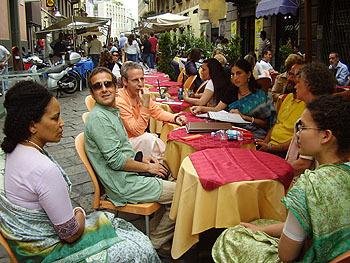 How sweet that even later, as we went to a typical Italian cafeteria, Sripad Goswami Maharaj continued to answer devotees’ questions and give suggestions for the distribution of the Gita to Italian readers. It is true that anything and everything the devotees of the Lord may appear to do externally, their inner hankering is always the constant service to Guru and the Vaishanvas. It is so important to be inspired in this way, as the association of the devotees is most conducive to spiritual life. I have come to learn this in the most practical sense, now having returned to Malta carrying only that sweet flavour in my heart, looking forward to the next opportunity. A typical Italian side street with cafe tables lining one side, alongside vendors of objets d'art and old books. Sripad Goswami Maharaj was very amused by this cow tape measure, whose tongue was the measuring tape! I would like to take this opportunity to give my obeisances to all the devotees of Sri Sri Radha-Krishna, particularly those who have made all this possible, manifesting the desire of Srila Gurudeva to have and maintain a permanent centre in Italy where one can practise Krishna consciousness in the association of loving devotees. Jay Villa Govinda ki jaya!